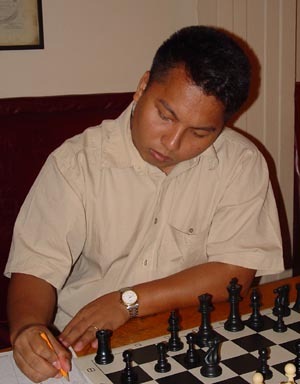 The Filipino IM, Jayson Gonzales is extremely dangerous in action chess. He showed this in the 17th NY Masters by winning the event outright over 5 GMs. He has a knack for making very natural moves quickly and for not panicking in bad positions. He is also never intimidated by his GM opponents as he declined a draw in a complicated time scramble against Rohde, and went on to win the game and the tournament. He has tremendous intuition although sometimes his calculation lacks precision. It also seems that sometimes he is apt to have bad spells and when he loses an early game the rest of his tournament does not end up so well. He is adept at many openings, but seems to prefer e4 and the Alekhines defense.